Here is a little pictorial of a look I created using Tom Fords eye shadow quad in Sahara Haze. I applied the beautiful yellow shade all over my eye. I then applied a little of the gray to my crease. I blended a little bit of the black colour in and then applied the glittering green to the outer corners blending in. Using MAC smoulder I liked my water line and smudges it below with a little bit of gray on the blending brush. SO simple and very glamorous. 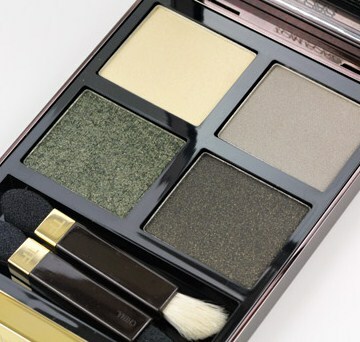 The perfect quad for that very Tom Ford dramatic night-time look! This is BEAUTIFUL and so are you woman! God I need some more Tom Ford in my life. yeah, I am not at all jealous. The last statement is also a FIG FAT LIE. Said it before and will say it again, you are gorgeous! Thanks girls! I LOVE this quad! I love a smokey eyeshadow! stunning colors amor, might have to get that Tom Ford quad. Your so bella it hurts. Thanks for the compliment amor. mostly all my clothes are thrifted.